Art History News: Sotheby’s Impressionist & Modern Art Evening Sale on 28 February 2018. Sotheby’s Impressionist & Modern Art Evening Sale on 28 February 2018. 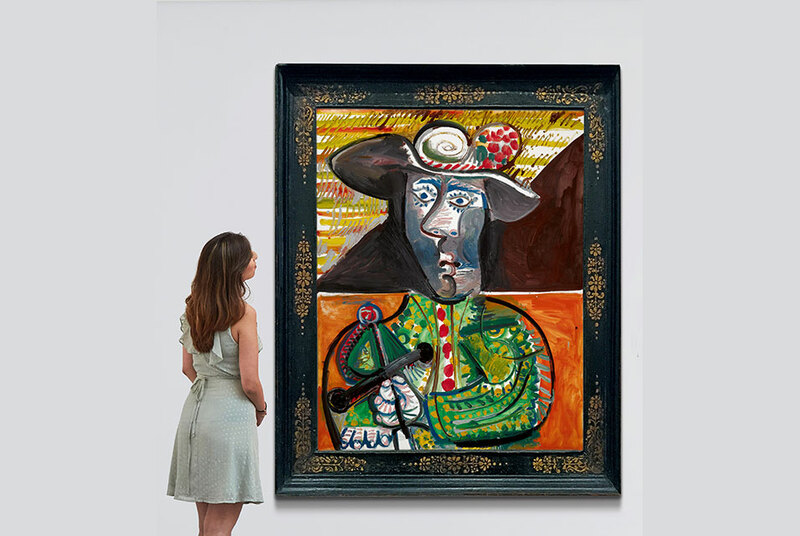 Monumental in scale, highly charged and painted in vivid colours, Le Matador is the culmination of a life-long obsession of Picasso’s that remained one of the most important themes throughout his career. Pablo Picasso, Le Matador, oil on canvas, painted on 23 October 1970 (est. £14,000,000-18,000,000). Courtesy Sotheby’s. The painting is a brilliant display of the virtuosity with which Picasso combined the complex elements that had shaped his life and art and stands as a defiant tribute to the heroic figure of the matador – embodying the artist’s own Andalusian machismo as the master of modern art takes centre-stage in the arena. Picasso had begun to feel that his time on this earth was running out, and so engaged in constant conversation with the great masters before him – Goya, Velasquez and Delacroix – following the traditions they had set in order to reinvent them and make a lasting mark. Appearing at auction for the first time, the work has been unveiled in Taipei and New York, before it is shown in the preview in London and offered in Sotheby’s Impressionist & Modern Art Evening Sale on 28 February 2018. ‘This powerful portrait exemplifies Picasso’s creative force in his final years and represents the culmination of a life-long obsession. Through the subject of the bullfight, Picasso explores the theme of life and death, creation and destruction, earth and sun, casting himself at the centre stage of the spectacle. We are thrilled to be presenting two prime examples of works by Picasso at his very best in one sale – Le Matador and Femme au béret et à la robe quadrillée (Marie-Thérèse Walter) – both from key periods of the artist’s career.’ The bullfight became a symbol for the most public display of violence, bravery and ability and for Picasso its attraction certainly lay in its powerful contradictions: grace and brutality, entertainment and tragedy, and ultimately, life and death. This work is unique in conveying a human dimension that is lacking in many of the earlier depictions, with the matador’s stylised face and large, wide open eyes revealing a vulnerability and sense of mortality that reflect the artist’s own concerns. The experience of being taken to the bullring by his father at the age of eight had a strong impression on Picasso, and his first painting, Le petit picador jaune, was of a matador on a horse in the arena observed by the spectators behind him. It is all the more fitting that at the end of his life, he returned to the celebrated imagery of the bullfights that he had grown up watching. Despite leaving Spain to live in Paris in his youth, Picasso retained a sense of Spanish identity, and the matador was the character that allowed him to draw attention to his heritage. During the last years of the nineteenth century Picasso stayed in Madrid, where he copied the old masters at the Prado, and was no doubt influenced by Goya’s bullfighting scenes. Picasso’s personal memories became intertwined with his artistic heritage, and in this final series of matador portraits the ghost of Goya is strongly present. Le Matador was included in the exhibition of Picasso’s last great works, organised by Jacqueline at the Palais des Papes in Avignon shortly after the artist’s death in 1973 – presenting the closing period of his oeuvre on the historical walls of one of the most important medieval Gothic buildings in Europe. A Pablo Picasso painting depicting his muse Marie-Therese Walter with future lover Dora Maar emerging from the shadows behind is expected to fetch an eye-watering sum at a London sale next week. 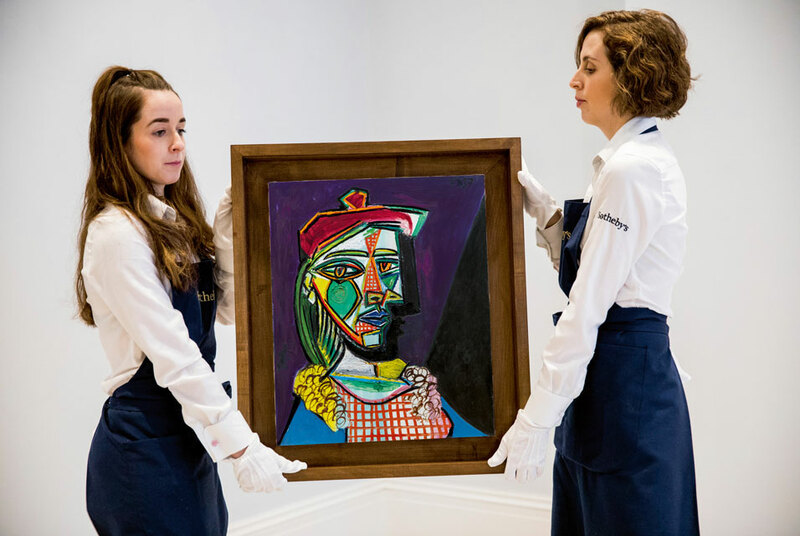 The 1937 "Femme au Beret et a la Robe Quadrillee (Marie-Therese Walter)" is expected to reach $50 million (40 million euros) at a sale of Impressionist, Surrealist and Modern Art at prestigious London auction house Sotheby's on Wednesday. It comes from a key era in Picasso's career, 1937, when he makes the great painting 'Guernica'," he added, referring to the masterpiece which portrayed the horrors of the Nazi bombardment of a Basque city during the Spanish civil war. The painting also has a strong autobiographical appeal. The main subject of the piece, Marie-Therese Walter, was the Spanish painter's long time lover and muse. But the looming figure of Dora Maar, whom he met in 1936, emerges in the shadows behind Marie-Therese. Two Salvador Dali paintings are also up for sale.